Chief Complaint: Patient on Amiodarone therapy. No visual complaints. History of Present Illness: 54-year-old white male with a known history of atrial fibrillation and hypertension. The patient had been on Amiodarone therapy for several years. Two months prior to this routine follow up, the patient's primary care doctor made a change in the patient's cardiac medications which included the removal of amiodarone from his medication regimen. The patient has no vision complaints. PMH/POH: Atrial fibrillation and hypertension. No other ocular or health problems. SLE notable for corneal deposits in the cornea at the level of the basal epithelium, inferiorly OU. 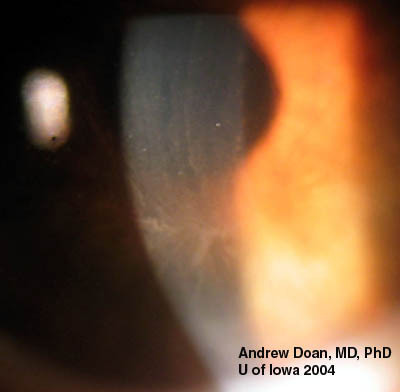 Deposits form a faint golden-brown whorl pattern evident in both corneas (see Figure 1). 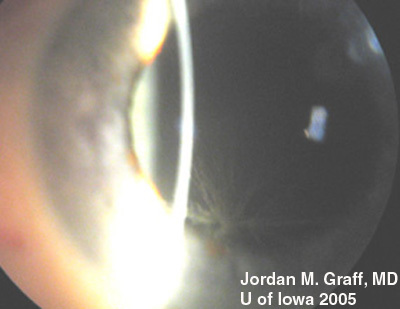 Figure 1: Whorled pattern of corneal verticillata on the inferior cornea in patient with chronic amiodarone use. Figure 2: Another example of similar findings in a patient taking amiodarone. In the case of our patient, he had developed classic corneal verticillata from amiodarone use. As can be seen, the verticillata are somewhat less distinct than some published examples. Having been off the medication for 2 months, it is expected that the deposition pattern will diminish, as is the case for the vast majority of patients. Verticillata almost never cause vision complaints. Rarely, patients may notice haloes. The deposits occur within the subepithelium, do not stain, and are non-irritating. It has been hypothesized that the amphiphilic drugs that deposit verticillata may form complexes with phospholipids in the cells. These complexes cannot be metabolized by lysosomal phospholipases. Tissues where phospholipids content or turnover is high, lamellar or crystalloid deposits may occur. Verticillata from indomethacin, amiodarone, chloroquines, and phenothiazines are similar in this respect. Verticillata from Fabry disease are similar in appearance to those caused by medication related deposits. Fabry disease is a glycolipidosis caused by deficiency of the alpha-galactosidase A (alpha-Gal A) enzyme. In addition to the verticillata and corneal spoke-like deposits, patients often have severe pain in the extremities, and characteristic skin lesions (angiokeratomas). In the third or fourth decade of life, more severe effects of the disease are manifest including progressive cardiovascular, renal, and cerebrovascular disease (seizures and strokes). 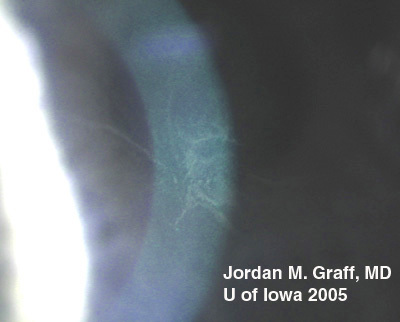 Some heterozygote female carriers of the alpha-Gal A defect may express varying degrees of the disease as carriers, including corneal verticillata. There is no data to suggest protective nor inducing factors in patients who develop verticillata from medication use. Most studies suggest that all or nearly all patients taking amiodarone will develop verticillata. Regarding Fabry disease as a separate entity, it is a rare disorder (1:40,000) with no race predilection. Fine, golden-brown or gray opacities branch out from a central whorl, usually across the inferior cornea. There is no recommended treatment for verticillata and medication regimens are not altered based on the presence of corneal deposits. When depositing drugs are stopped for other reasons, as in the case here presented, most verticillata will eventually fade away. Chew E, Ghosh M, McCulloch C. Amiodarone-induced cornea verticillata. Can J Ophthalmol. 1982;17(3):96-9. Hollander DA, Aldave AJ. Drug-induced corneal complications. Curr Opin Ophthalmol. 2004;15(6):541-8. Arffa RC, Eve FR. Systemic associations of corneal deposits. Int Ophthalmol Clin. 1991;31(3):89-110. Masson C, Cisse I, Simon V, Insalaco P, Audran M. Fabry disease: a review. Joint Bone Spine. 2004;71(5):381-3. Orssaud C, Dufier J, Germain D. Ocular manifestations in Fabry disease: a survey of 32 hemizygous male patients. Ophthalmic Genet. 2003;24(3):129-39. Clinical Approach to Depositions and Degenerations of the Conjunctiva, Cornea, and Sclera. In Sutphin Jr. JE, Chodosh H, Dana MR, Fowler WC, Reidy JJ, Weiss JS, Turgeon PW, External Disease and Cornea. Section 8, Basic and Clinical Science Course. San Francisco: American Academy of Ophthalmology; 2004; Chapter 17, p. 353.